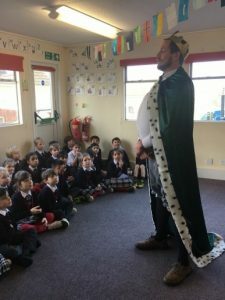 This week in Year 2 we were honoured to welcome Henry VIII to our history lesson on Tuesday. He was impressed with our factual knowledge about his life. Maryam arrived with a list of his six wives. He assured us that bear baiting and falconry were rather entertaining past times but the children were unconvinced! Luke J thought that he looked strangely familiar!! The Year 2 classes have started a new science topic on materials. This week we decided on criteria to sort them. We decided that paper is an amazingly versatile material. Most children did not know that leather is animal skin! There were some horrified faces! Please remember to practise your bonds to 10 and 20 – they will help you this week and next.